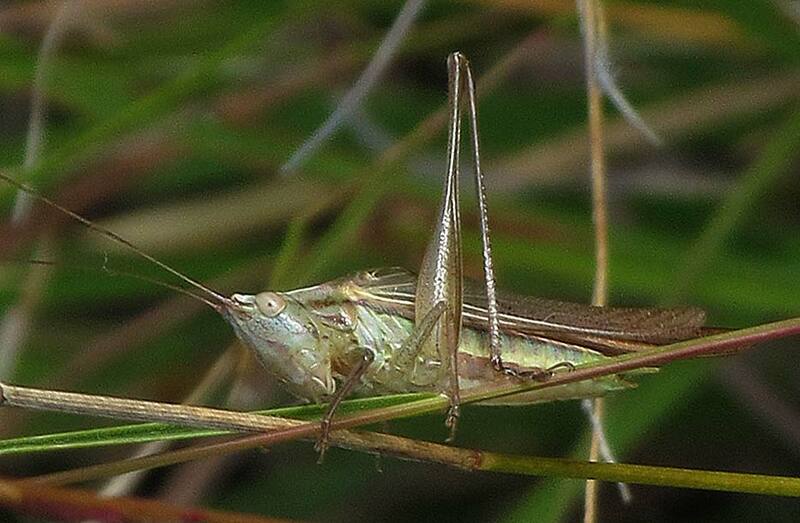 Listen to this Long-tailed Cricket Eurepa marginipennis stridulating (i.e. rubbing its wings together to produce its distinctive call). 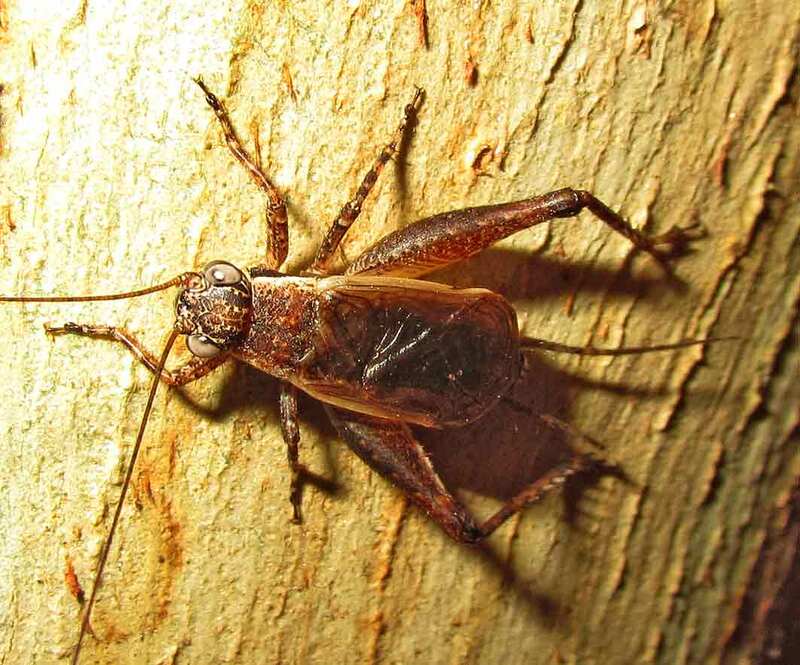 This cricket was also making use of a piece of tree-bark to reflect and amplify the sound. Note how the wings are raised up when calling. Recorded and photographed by me, Capertee Valley, NSW, 7 pm, 15th March, 2012. (recorded with Telinga clip on mics, 1 channel only, to Olympus LS10 recorder). 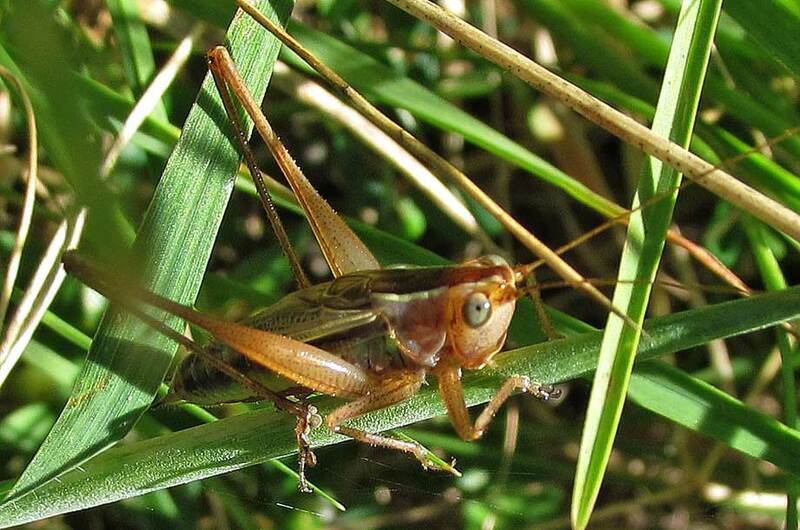 See a 20-second movie of the Long-tailed Cricket stridulating, here. (the Quicktime movie will open on a new page and may take a few moments to load up as it is 4.5 mb). 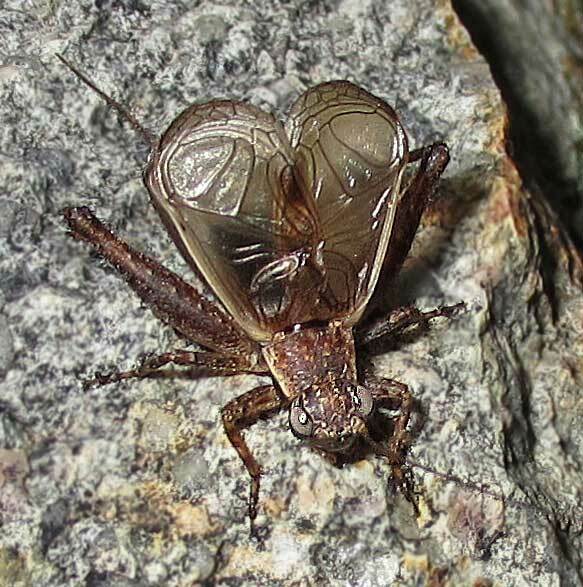 Katydids and crickets ‘sing with their wings’ – wings are rubbed together (stridulation). 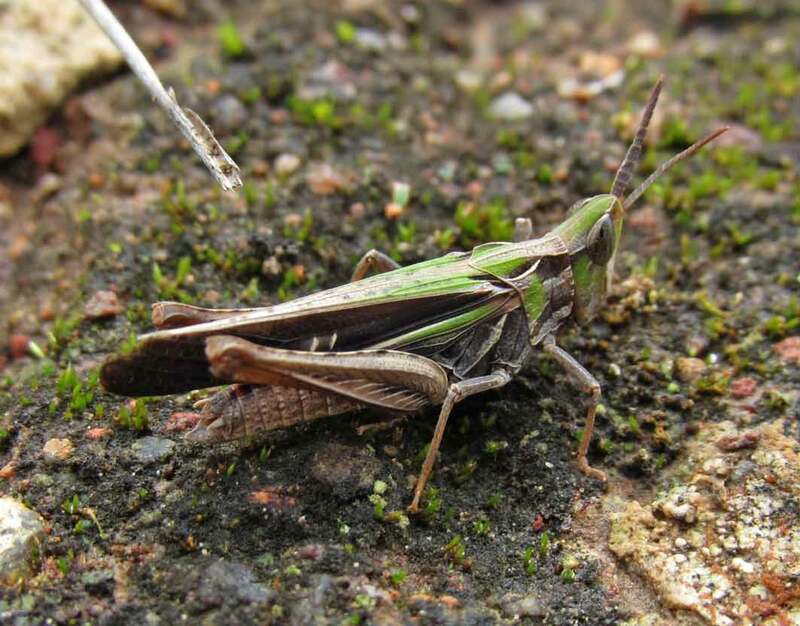 Grasshoppers ‘snap and buzz’ with leg-on-wing clicks and wing buzzing (crepitation). 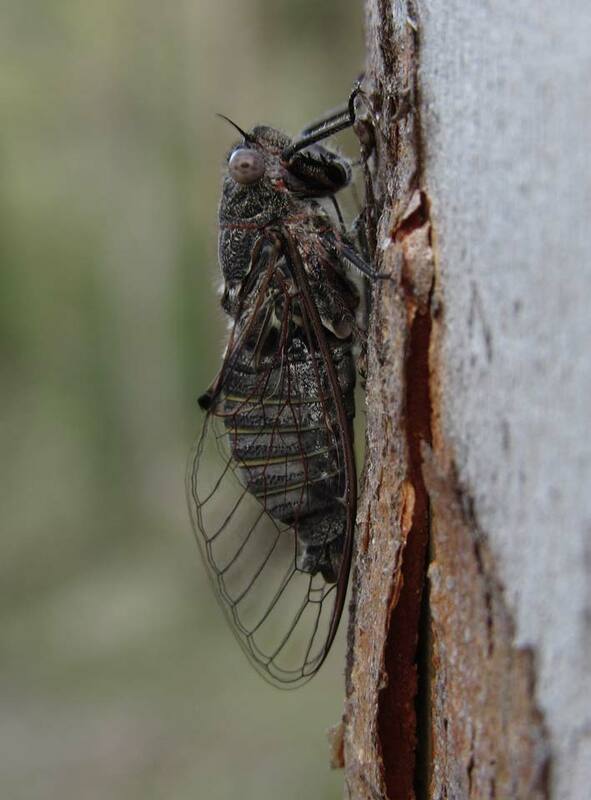 Cicadas ‘flex their tymbals’ causing their hollow body to resonate. 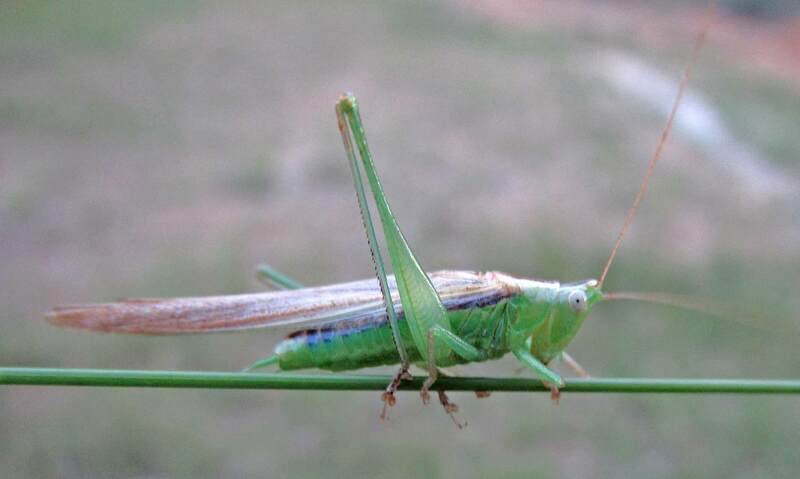 “Sounds Like Summer – the beginners guide to insect sounds” by Vicki Powys, from Audiowings, the journal of the Australian Wildlife Sound Recording Group, Volume 2, No. 2, September 1999. Continue scrolling down the page for more sounds, photos and sonograms of some of my local insects. and yes I did count the wing spots, there really are 32 of them! 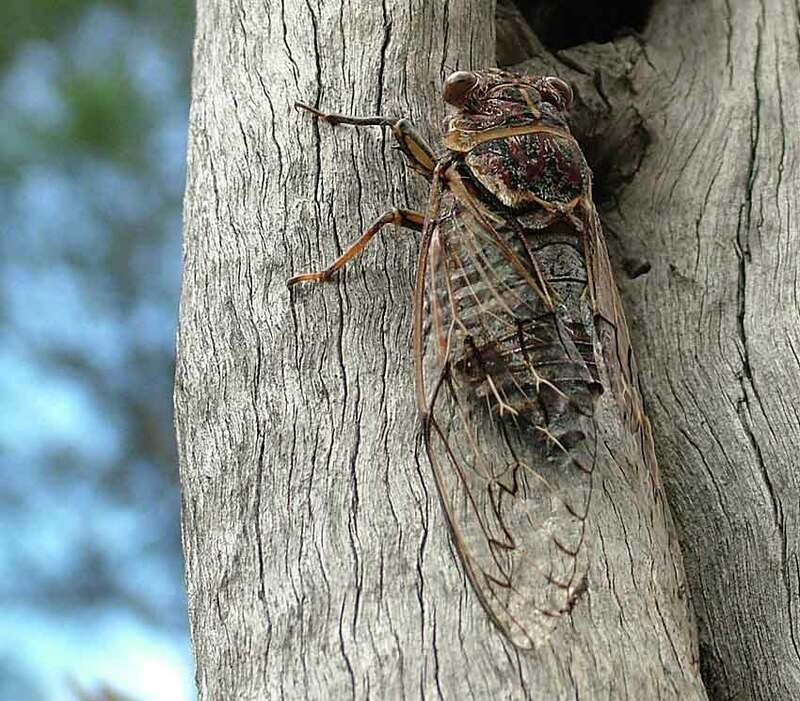 Of all my local cicadas this one is the loudest – turn up the volume of the recording until your ears hurt and that is the true level of their call ! At dawn and dusk they synchronize their calls with their neighbours so that the sound travels in slow waves across the landscape. Black Squeaker, Pauropsalta encaustica sp. It took me a while to figure out that this was not a fly or a wasp, but in fact a tiny cicada and just 1-2 centimetres in length. It has quite a loud call that sounds to me like d-dee-dit repeated over and over. They usually look small and black although this one that I photographed shows some greyish markings indicating it is a fresh specimen. It was calling from the trunk of a tree. This tiny grasshopper (2 cm approx.) loves to go buzzing about over green lawns and paddocks on hot sunny days around noon. The buzzing behaviour seems to be territorial. 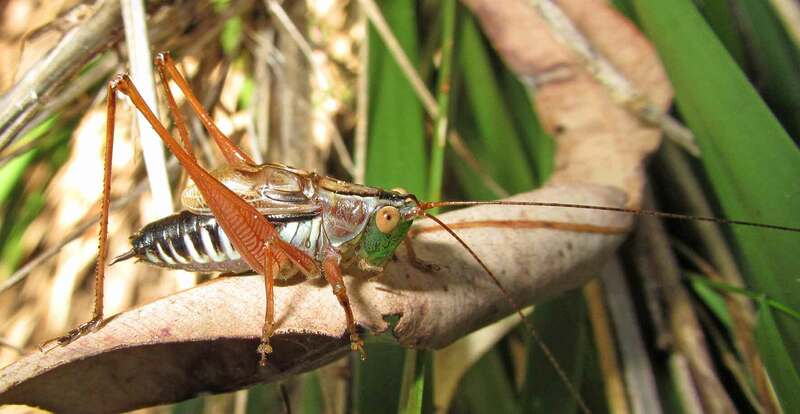 The grasshopper will sit hidden in the grass then suddenly launch into a short buzzing figure-of-eight flight about half a metre above the ground. When one buzzer starts buzzing, several neighbours will often join in. The buzz is very loud and is made by crepitation (in this case with a leg touching against a flying wing). When the buzzer lands it will often give a series of leg-clicks at intervals of about 1 second. These Froggatt’s Buzzers were recorded in stereo on my back lawn on March 15, 2012, Capertee Valley NSW, 12.45 pm, sunny, 27 degrees C. MKH 8020 mics in DIY foam SASS to Sound Devices 702 recorder. Waveform and sonogram for Froggatts Buzzer, note the wide range of frequencies in the buzz, compared to the pure tone of the cricket at the top of this page. You can hear the leg clicks between 10 and 20 seconds. How high can a Froggatt’s Buzzer go? I made another recording using the MKH 8020 mics, this time setting the sample rate of a Sound Devices 702 recorder to the maximum of 192 K. The sonogram above was made using Izotope RX and Photoshop. The buzzing call registers at a remarkable maximum pitch of 60 kHz ! This is way beyond what humans can hear. 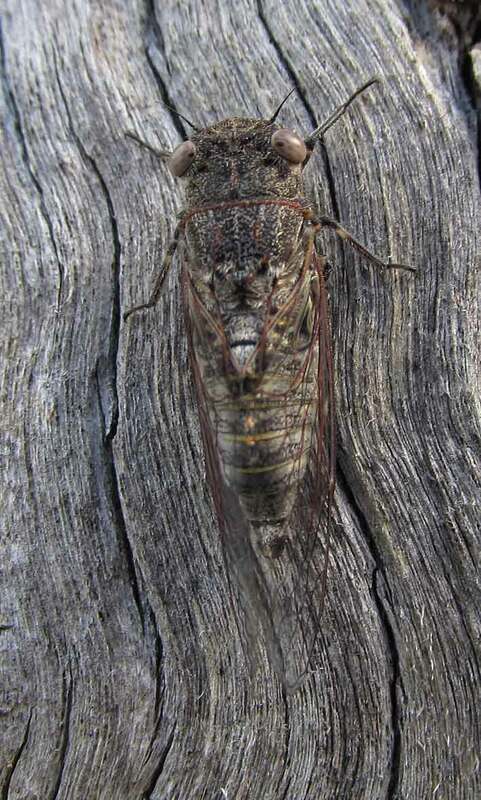 This type of ultrasonic call also occurs in some European grasshoppers. 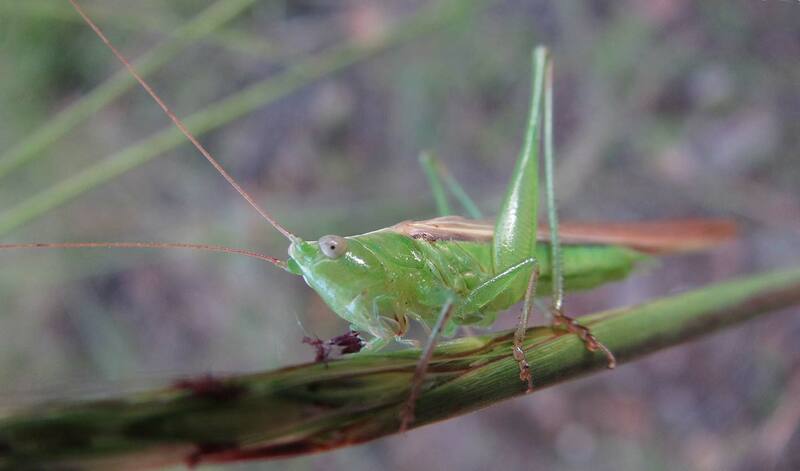 Here are three of the more common varieties of Australian Meadow Katydids, so called because they live in grasslands and eat grass-seeds. They have ultrasonic buzzing calls that can be difficult to hear. A useful aid to finding katydids is a hand-held bat detector, like this one. 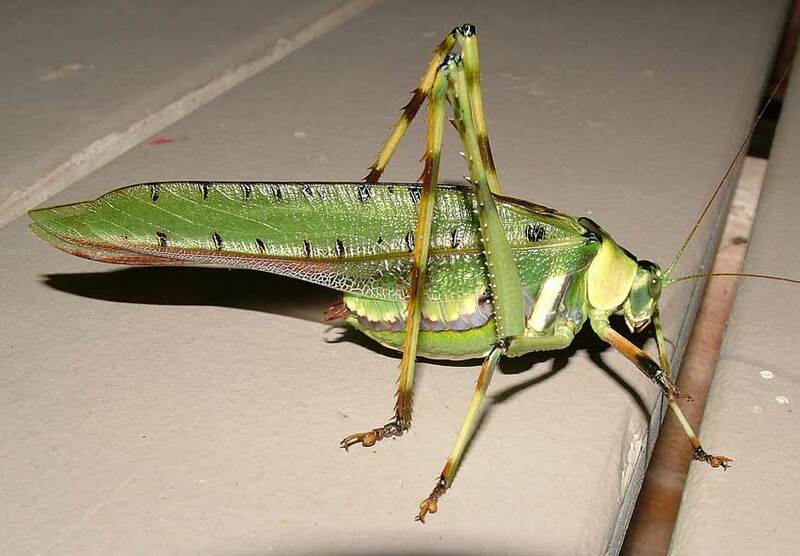 It will pick up the sound of a buzzing katydid from many metres away. I found this male calling in lomandra sedges beside a local creek. It is about 2 cm (one inch) in length and has a rhythmic buzzing call. this next photo shows the really long antennae! (the Quicktime movie will open on a new page and may take a few moments to load up as it is 3.5 mb). 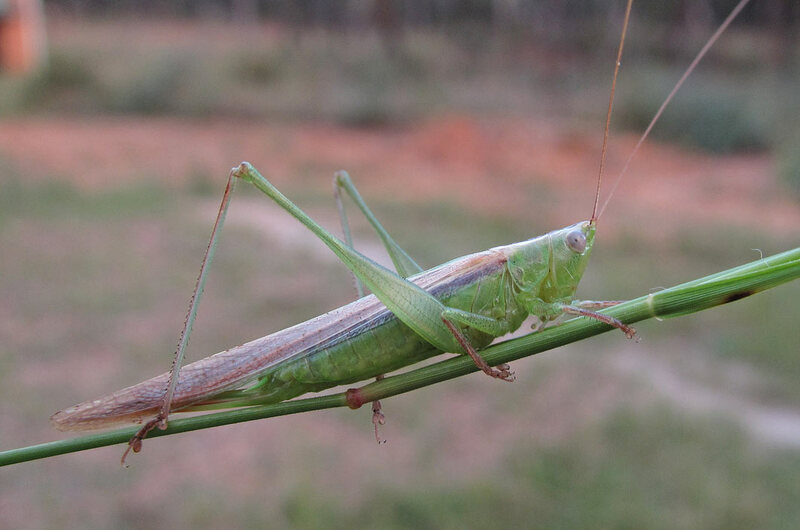 This katydid looks similar to the Blackish Meadow Katydid but it has a pale face, a green striped body, and the call is slightly different. This male was calling from the stems of native grasses. It is missing one hind leg. (the Quicktime movie will open on a new page and may take a few moments to load up as it is 5 mb). 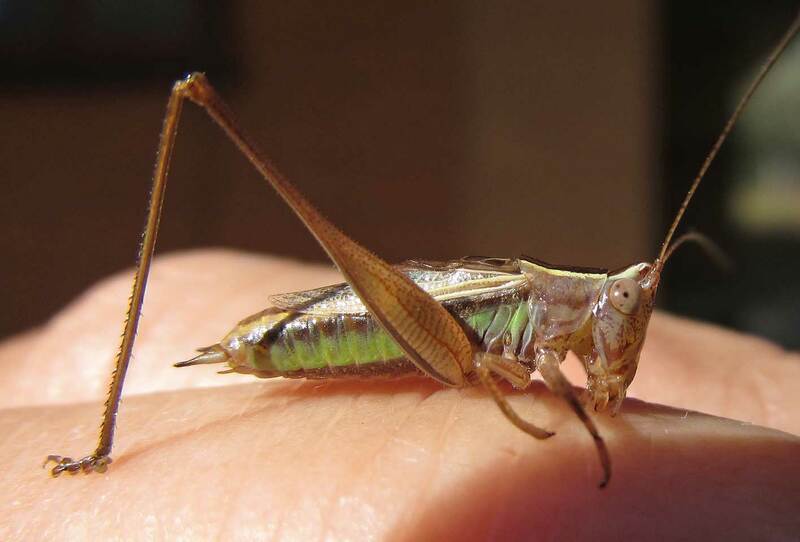 This katydid has long brown wings, white eyes and a translucent green (or sometimes brown) body. The body is about 1.5 cm in length, plus wings makes it about 3 cm long. The call is a continuous soft fizzing sound in warmer temperatures, but alternating revving and idling in cooler temperatures. This is a green male, eyeing the camera lens. 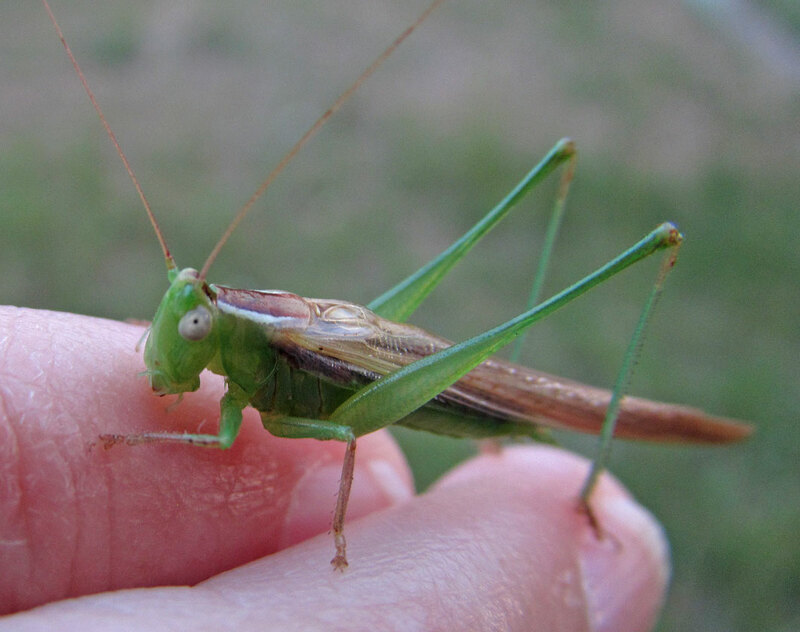 Here is a green female, note the ovipositor (egg laying tube) at the rear end, partly hidden by the wings. Eggs are laid in grass stems. This is a brownish male, found in the same general area as the green ones and giving the same type of song. I’m not sure if individuals change their colour over time or are just permanently green or brown. This sonogram shows the ultrasonic range of the call. How do they make the sound? The hotter it is, the faster they sing! A ‘pulse’ occurs with each movement (in and out) of the outer pair of wings. 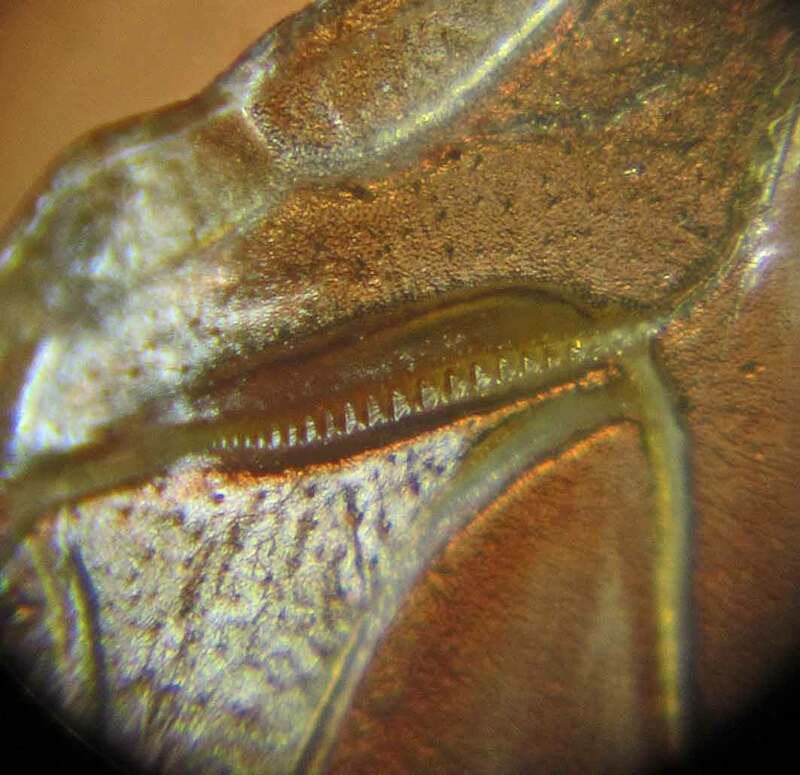 There is almost no sound when the wings open but when they close, a row of teeth called a file (which is on the underside of the left wing) comes into contact with a scraper on the inside edge of the right wing. Think of it like a fingernail running along the side of a plastic comb, only on a much, much smaller scale. 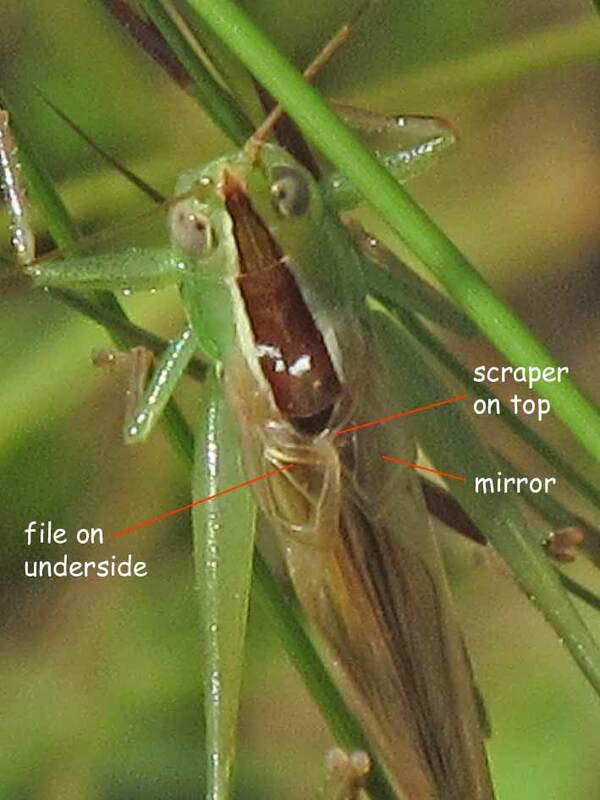 The sound is magnified by a hard thin membrane on the right wing called a mirror. When the scraper hits each individual tooth, this is known as a ‘strike’. For this species, each pulse has about 13 tooth-strikes. With 50-80 pulses per second all you can see is a blur of wings and all you can hear is a faint buzzing sound. The tooth-strike rate is between 650 and 1040 strikes per second (i.e. 50-80 wing movements x 13 tooth-strikes). That equates to something like 300 million tooth-strikes in one week of calling. You would think the scraper and the file would soon wear out but apparently they do not. Using the software Audacity, I slowed down the call by a factor of 32 (i.e. one thirty-second of normal speed) so that you can now hear the individual pulses – it sounds like a frog croaking! The above call is further slowed to one-quarter speed (which is one 128th of the original speed). Now you will hear the dull beat of a drum where each beat is a strike of the scraper upon a single tooth of the file. With the expanded waveform below you can see how each pulse is made up of about 13 strikes. If there are 13 tooth-strikes for each wing movement, does this mean that the file on the underside of the left wing will have a similar number of teeth? The answer is YES! 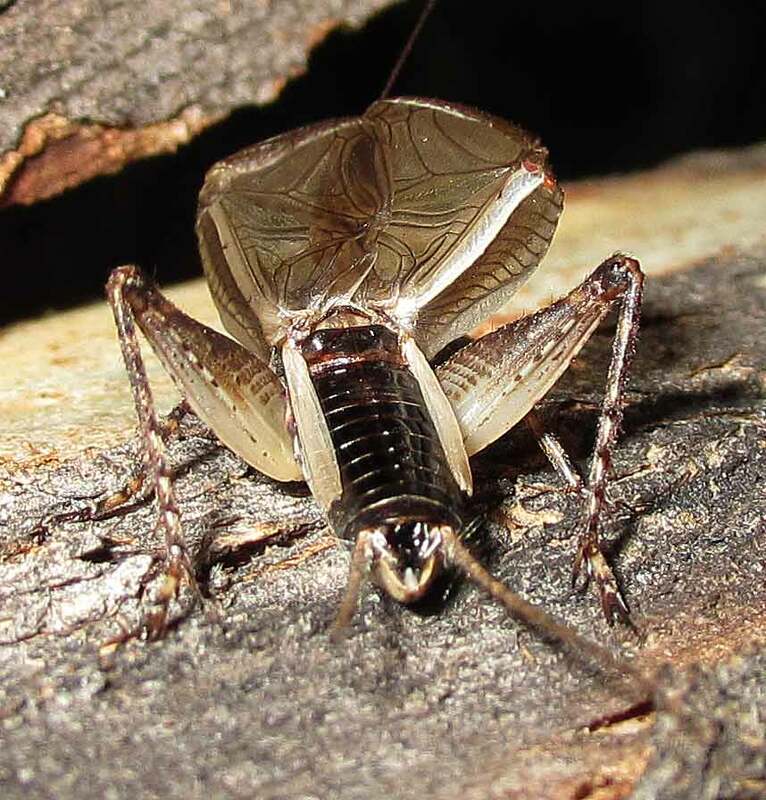 Here is a picture of the left wing underside of a brownish Upolu Meadow Katydid. You will see the file has about 22 teeth so not all of them are used. Here are the left and right outer wings photographed close-up. Look for the differences between the wings – the file on the underside of the left wing is the one that is used to make sound, but the right wing underside also has a rudimentary file with very tiny teeth. The mirror on the right wing is used to amplify the sound, but the left wing also has a mirror-like structure that is somewhat thicker and less resonant. The scraper on the right wing is a distinctive shape, compared to the left wing. If you look closely you should just be able to make out the teeth on the file of the underside of the left wing. Page created 2012 and upgraded 6 June 2017.